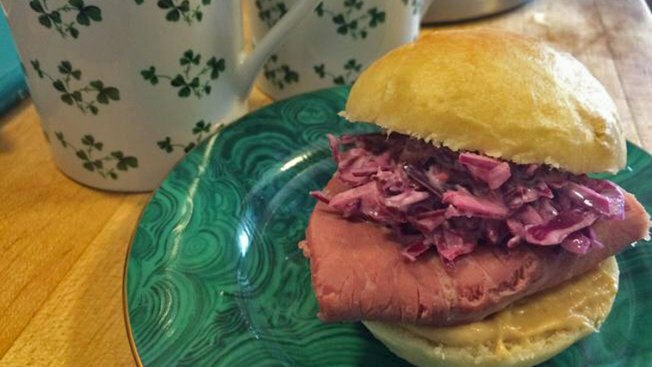 Create a big Irish party menu to celebrate St. Patrick’s Day. For this year’s St. Patrick’s Day celebration, I’m creating a buffet of easy to eat items. This week I have corned beef sliders on homemade potato bread rolls and an Irish stout cheese spread that’s great with vegetables, crackers and smoked salmon. I’ll be adding more to the mix next week, so check back for the second part of the menu. Place potatoes in a medium pot. Fill with water to cover. Bring to a boil and then simmer for 20 minutes. Drain, reserving 1/2 cup of the water. Mash potatoes with 1 tablespoon of the melted butter. Set aside. Place yeast, 2 tablespoons of flour and 2 tablespoons of brown sugar in a medium sized bowl. Stir in the 1/4 cup of warm water. Let mixture sit for 5 minutes. Place 5 1/2 cups of flour and 1 teaspoon of salt in a large bowl. Add 4 tablespoons of the melted butter, dijon mustard, eggs, milk, mashed potatoes, and the 1/2 cup of reserved water from boiling the potatoes. Sir together and mix in yeast mixture. Work in as much as another 1/2 cup of flour or more until mixture is smooth and not sticky. Roll onto a floured board and knead for about 10 minutes. Pour olive oil into a large bowl. Add dough and turn it until all surfaces are covered with oil. Cover bowl with a towel and set it aside for an hour until dough doubles in bulk. Punch down dough and divide it in half. Working each half separately, divide dough into 12 small balls. Place on a baking sheet evenly spaced apart from each other. Repeat with second batch of dough. Cover with a towel and let dough rise for 30 minutes. Preheat oven to 350 degrees F. Brush the tops of the balls with half of the remaining melted butter. Place in the oven and bake for 18-20 minutes or until rolls are golden brown. Remove from oven and brush with remaining butter. Allow rolls to cool. To make sliders, slice rolls and spread each half with a bit of stone ground mustard. Top with a slice of corned beef and red cabbage slaw. Mix all ingredients together in a large bowl. Taste for seasoning and adjust to your preference. Cover and refrigerate until ready to serve. Place all ingredients except the parsley and chives in a food processor. Blend until smooth. Transfer ingredients to a large bowl and stir in parsley and chives. Serve with fresh vegetables or crackers. Cut slices of dark rye or pumpernickel into smaller bite sized pieces (I used a small circle cookie cutter). Spread each with stout spread and then top with a bit of smoked salmon, minced shallots and chopped fresh dill.